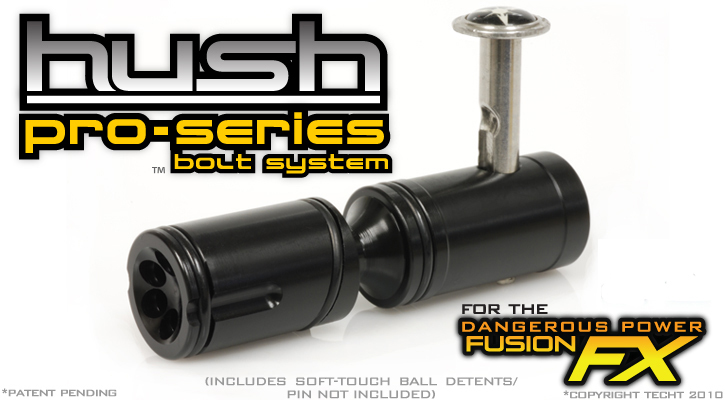 TECHT PRO SERIES Hush Bolt System for the Dangerous Power Fusion FX! The Best Upgrade for your FX!!! The TECHT Pro Series Hush Bolt is designed to improve the overall performance of any Dangerous Power Fusion FX. We did this by aiming to make the most air efficient bolt while achieving the lowest possible sound signature. 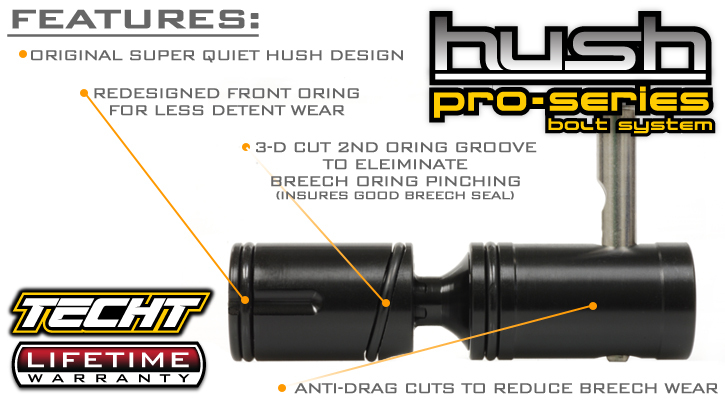 TECHT's Pro Series Hush Bolt for the Dangerous Power Fusion FX marker utilizes our "Even-Flow" venturi face technology. This "Even-Flow" venture face along with our Sweeping Air Diversion Ramp allows the Hush Bolt to obtain optimal efficiency, while quieting the sound signature of the Fusion FX significantly. The Hush Bolt achieves better efficiency by capturing and utilizing air that is otherwise wasted. The two rearmost o-rings capture all of the air released and forces it through the bolt to fire the ball, and the front o-ring seals in the breach to ensure that the air cannot escape anywhere except down the barrel propelling the ball. Additional Features in the TECHT FX Pro Series Hush Bolt include an angled 3-D cut o-ring groove to avoid breech pinching. The front o-ring has also been redesigned to decease detent wear. The rear portion of the bolt has been modded to reduce drag and breech wear. Three times rebuild for the TechT Hush Bolt for the Dangerous Power FX.